amplifiers, processors, interfaces, controllers and computer-related products. 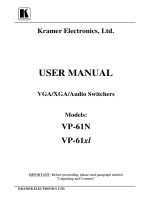 Kramer VP line of switchers. All these VP switchers are similar in operation and features. DA.). Computer graphics resolution is measured in pixels and signal bandwidth. able to use more colors (256) but at a lower resolution- around 320x200 pixels, which was very crude. ability to faithfully reproduce the signal. the distance is limited to several tens of meters. that it would be received properly at the receiver end. to poor matching and cause elevated noise levels. They should therefore be of the best quality. breaks in the signal path. low distortion and low noise operation. from any mains power cables, electric motors, transmitters, etc. even when the cables are shielded. 9.6" x 7" x 1.8"
8.7" x 7" x 1.8"
section doesnвЂ™t apply to you, you donвЂ™t have to spend your time reading it. packaging materials for possible future transportation and shipment of the switcher. 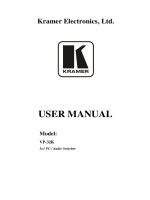 The following accessories which are available from Kramer, can enhance implementation of your switcher. For information regarding cables and additional accessories, contact your Kramer dealer. be installed on each adapter. and the acceptors. It is a full bandwidth distributor designed for computer and workstations applications. 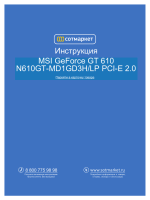 used with the highest quality graphics workstations. effective solutions for a variety of applications. bandwidth of over 350MHz allows it to be used with the highest quality graphics workstations. 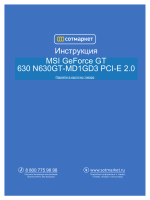 may be used with the highest quality graphics workstations. the full power of your switcher. graphics workstations. Front/Rear panel features of the VP-31 are described in Figure 1 and Table 1. For operation instructions refer to section 9. Supplies power to the unit. Select the desired input to be switched to the output. holder houses the appropriate fuse. 300 MHz allows the VP-32xl to be used with the highest resolution graphics workstations. Front/Rear panel features of the VP-32xl are described in Figure 2 and Table 2. Amplified and buffered audio outputs. Amplified and buffered video output. one monitor or vice versa, with no discernible signal degradation. The VP-61RS also has RS-232 control. allows the VP-61RS to be used with the highest resolution graphics workstations. Front/Rear panel features of the VP-61RS are described in Figure 3 and Table 3.
master/slave configurations, and device ID numbers. against the rails of your rack, and insert standard screws through each of the four corner holes in the rack ears. signal format will match that of the input signal format. (Example: If VGA is input, then VGA is output). connectors located on the back of the unit. control signals to the switcher while it is powered on! cord from its socket after it has been turned off. glows and the active input button illuminates, as well. 9.3). These buttons correspond to the input connections as marked on the back panel. By touch buttons on the front panel (see section 9.2 "Selecting an Input on the Switchers"). 1-3 selects the active input to be switched to both outputs "1" & "2". 1) By touch buttons on the front panel (see section 9.2 "Selecting an Input on the Switchers"). вЂњProtocol Used for VP-61RS Communication"). switchers which, in turn, permit access to various pieces of equipment (monitors, mixers, editors, VCRs, etc). VS-2000 marked "Port 1" to "Port 6" using straight DB9 to DB9 male to male flat cable. to DB9 connector if you are using the null modem adapter, or connect as in Figure 7.
transformer with a positive center pin. Turn on all the machines and the VS-2000. reference. The file name BC20PROT.HLP is the communication protocol for advanced users. for operating the switcher, both are available without removing the switcher cover. It can be operated by touching one of the front panel switches. It can be operated by a remote PC via the RS-232 connectors on its rear panel. configurations so that the switchers may operate independently, or in conjunction with each other. machine replies (switch 4 is enabled). Master "Reply" setting is always ON. Connect all component sources to the appropriate inputs of the switcher. Connect XGA/VGA acceptor/s to the output/s of the switcher. Connect PC or controlling unit. Operate the switcher, sources and acceptors. Select the required input to be switched, using front panel input selector pushbuttons. Always keep distances between sources and acceptors as short as possible. components are of unequal lengths. which deteriorates rapidly when using low quality cables. make the connections as in Figure 8, or extend pins "5" and "9" only. 1) Insert the program diskette #1 into the floppy drive of your PC. 2) From within Windows95В®, or higher run the Setup.exe file on the first diskette and follow the instructions. 3) Once the installation is completed, the K-Switch program may be run. individually using this option. Note that machine number "1" is always the Master. yellow and it turns red when connected (clicked). buttons again or by clicking the right button of the mouse. recall a configuration, click on the Recall button and then select the desired Setup Window Number. When clicked, allows you to select a different switcher model. number from 1-4 followed by clicking the Save button, changes the active port number. Displays the current configuration of the connected switcher on the screen. About). Click Ok after the selection is complete. When clicked, allows you to exit the program. You are prompted to confirm that you want to exit. Used by the operator to name a selected input. The input name is saved when the Save button is clicked. are stored when the Save button is clicked. 1) Connect your switcher or matrix to an identified serial port of the PC. 2) Turn on the switcher/matrix. on the K-switch icon. You may create a shortcut to the program and locate it in a convenient location. click Ok. The Port screen disappears and the Switcher screen remains. Select the desired switcher model and then click the Select button to confirm your selection. The Main Menu (with the switcher model number on top) appears. image representing its control panel on the PC monitor (with the current configuration). If the COM or switcher are not properly selected, "Communication Error" message appears. To exit the program, click the "Exit" button. You are prompted for confirmation. stores the active port number and your switcher ID. inside unused or open connectors. on again to reset the machine. operation, please consult your KRAMER Dealer. Confirm that rocker switch is in вЂњONвЂќ position, and LED is illuminated. power connector on your switcher. Tighten 2 screws and 3 brackets of the audio board. s cover by tightening its Philips screws. Confirm that the connecting cables are of high quality and properly built. Verify that the video line is well matched through 75ohm impedance. source input device or output display or recorder. isolation transformer in the signal path. Confirm that the connecting cable is wired for pins 1-9 straight through. switcher must be assigned the ID of вЂњ1вЂќ. the same type and power to all switchers must be on. then both of these should be set to вЂњ1вЂќ. 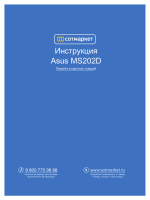 not, go back to Section 9.4.1 of this manual вЂњThe VS-2000 SystemвЂќ. selected in the control software. for the switcher to reply to a command before sending the next command. Confirm that the computer you are using supports true RS-232C protocol. Computers such as the Apple Macintosh do not! is equivalent to pressing switch No. 6 of the machine. to the PC, i.e. which input is selected on its front panel. present, then this confirmation is not sent to the PC). workmanship under the following terms. Labor and parts are warranted for three years from the date of the first customer purchase. Only the first purchase customer may enforce this warranty. listed in the web site www.kramerelectronics.com. a) Accident, misuse, abuse, neglect, fire, water, lightning or other acts of nature. b) Product modification, or failure to follow instructions supplied with the product. Repair or attempted repair by anyone not authorized by Kramer. d) Any shipment of the product (claims must be presented to the carrier). g) Cartons, equipment enclosures, cables or accessories used in conjunction with the product. costs are the responsibility of the Kramer dealer from whom the product was purchased. 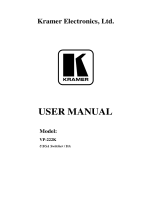 To obtain service on you product, you must take or ship it prepaid to any authorized Kramer service center. mailing a contact name, company, address, and a description of the problem(s). 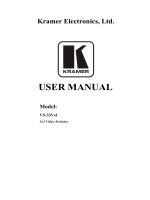 For the name of the nearest Kramer authorized service center, consult your authorized dealer. in duration to the length of this warranty. KramerвЂ™s liability for any defective products is limited to the repair or replacement of the product at our option. Part 1: Residential, commercial and light industry"
Residential, commercial and light industry environment". will void user authority to operate the equipment. Use the supplied AC power cord to supply power to the switcher and controllers. Please use recommended interconnect cables to connect the switcher to controllers and other components.